Sometimes I wish all of you could see my finished knits in person. 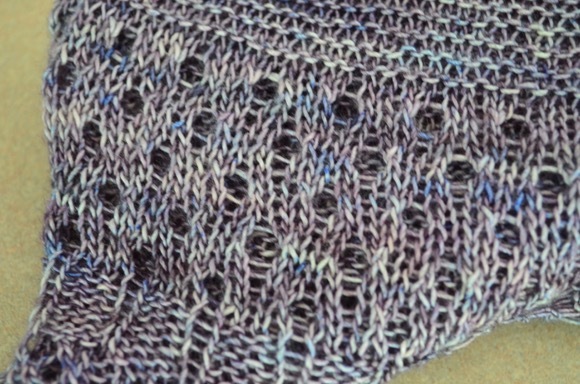 The softness and the shimmery effect of a wool silk blend is wonderful and cannot be captured with photos. Oh well, I hope you can conjure up some wonderful images of what I am showing you. 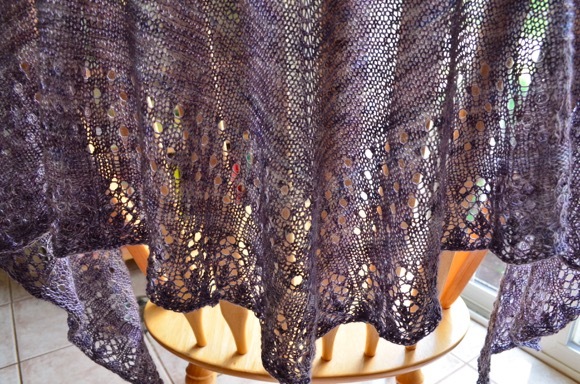 I finished my shawl before the busy weekend and blocked it once I returned home. I have my priorities. Andrea of This Knitted Life has embarked on indie dyeing some lovely yarns for her new business. She knows what she is doing! First of all, the quality of the single ply wool silk blend is spectacular. The yarn is a delight to knit with. When I soaked the wool, I didn't see a hint of purple in the water. 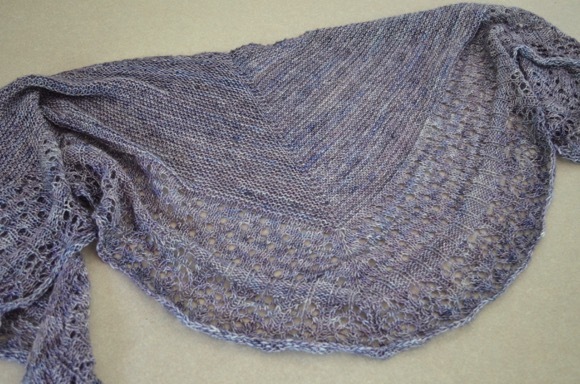 The rinsing was minimal since I used a wool wash to soak the shawl. Again, I love when a wool blend behaves exactly as I expect and makes the finishing a breeze. 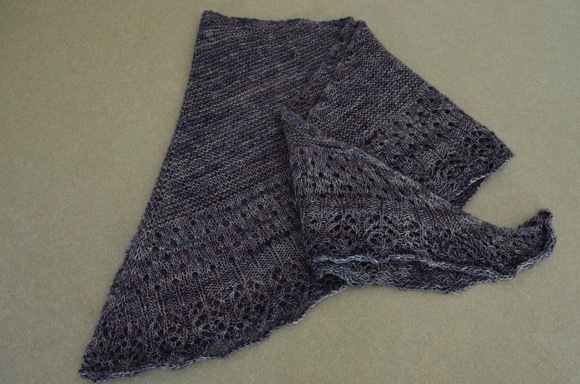 I used a pattern by Helen Stewart, Amulet Shawl. 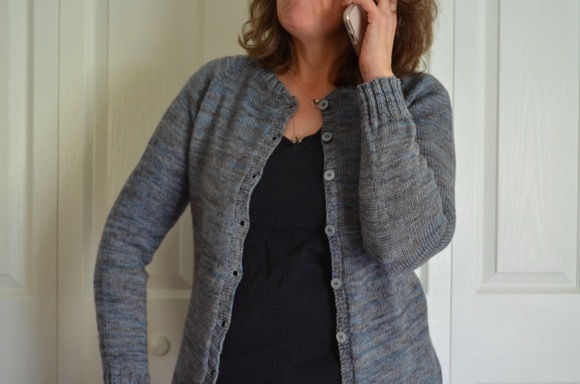 I love her designs because of how detailed they are written and the ease of the knitting. Not too difficult, not too easy. Just the right balance for some evening knitting. So pretty! I was clicking on your blog as your comment dinged my email. LOL! Beautiful, Karen! I love how it looks! Great color too! Such a beautiful finish! I love it. The color (and name) are spectacular. 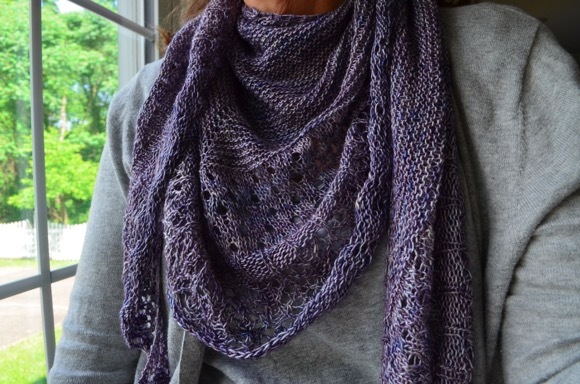 I just LOVE the even way the yarn took up the color purple. What a gorgeous knit. I may have to try it! That shawl is gorgeous. I love the yarn. 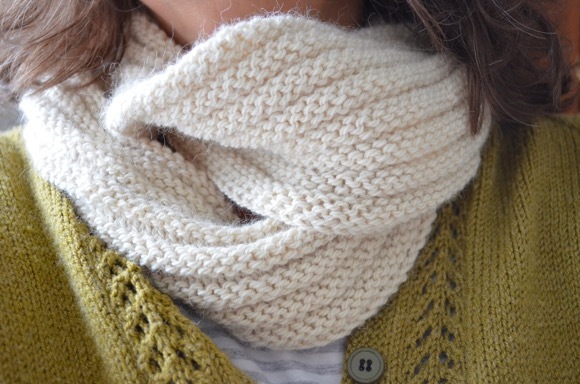 Love that pattern and the yarn, too. What a pretty color! Right now I'm working on a pair of socks and the dye is coming off on my fingers. Has this ever happened to you? 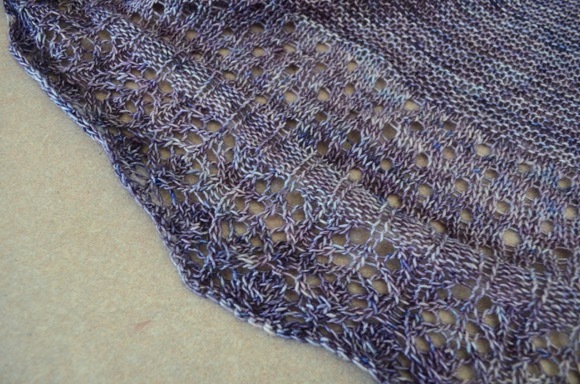 I love the color and the lace on this shawl. What a simply elegant beauty of a shawl. Gorgeous! I love the name - I kept expecting to see cowboy photos. :) I'm looking forward to knitting with some of Andrea's yarns. 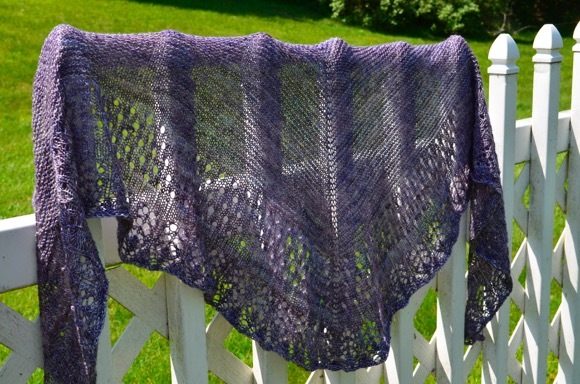 This shawl is spectacular and beautifully knit. I have been following Andrea's indie business on her blog. You chose the perfect pattern for the yarn. And wool/silk - perfect perfect. You and lace are like PB and J. Me and lace are like oil and water. This finish is lovely. It looks soft and airy. 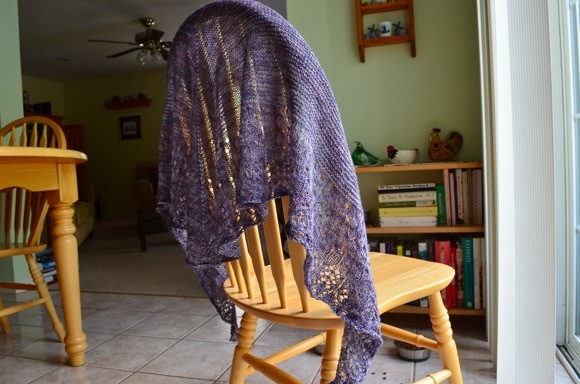 Your shawl is stunning, love the pattern and the way the wool drapes.